shopping trolleyspurchased either directly from ourselves or from one of our suppliers includes a Spare Parts & Accessory Order Form to enable people to buy replacement wheels, liners or a Pannier directly from J & C R Wood. This form includes all the necessary instructions on how to order the items necessary to ensure your Shop-A-Seat's life is extended well into the future. Alternatively, for further information on any of the products above or indeed any other spare parts you might require, please contact us. 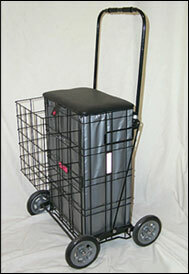 The carrying capacity of your Shop-A-Seat shopping trolley can be increased still further with this specially designed "hook on" pannier, which fits to the front of both trolley types.